In our northern gardens, few shrubs hold the distinction of providing genuine interest during every single season. Ninebark is one. In spring, ninebark foliage unfurls in brilliant colours adding wonderful contrast to the green foliage of surrounding shrubs. 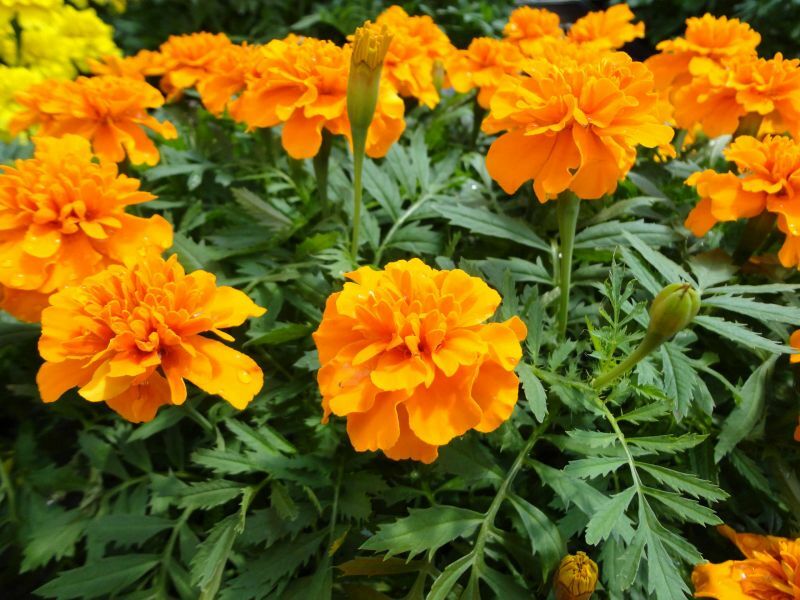 Dart’s Gold foliage emerges gold in spring and matures to a vibrant lime green in summer. The shrub’s arching branches seem to glow in the garden, particularly as the sun is rising or setting. Diablo boasts deep, dark purple foliage which is a superb shade for contrast in a shrub bed. Summer Wine, a more compact, hybrid ninebark with dense, wine coloured foliage, has been called a dramatic improvement over existing purple cultivars, like Diablo (from which Summer Wine was derived). Crossing Dart’s Gold and Diablo introduced another newer ninebark, Coppertina, which gives us autumn-like, copper-orange foliage in spring. As summer progresses Coppertina’s foliage transforms to a rich, deep purple-red. In summer, ninebark blooms. Tiny, five petal flowers are grouped together in dense, rounded, flat-topped white or pink-dusted clusters called corymbs. All ninebark corymbs contrast beautifully with the shrubs’ colourful foliage. Clusters of attractive reddish berry-like seeds follow the flowers. The seeds hold well into fall and will attract birds to your garden. In autumn the distinctive ninebark foliage changes colour but the shrub is still striking. Diablo, in particular, moves from its summer purple to orange then red as fall takes hold. When the foliage is gone and the branches are exposed in winter, ninebark reveals its namesake. Papery, exfoliating bark on mature branches peels back in strips exposing several layers of reddish and light brown inner bark, providing excellent winter interest in the garden. Said to have “nine layers of bark exposed at once”, this is how ninebark found its common name. 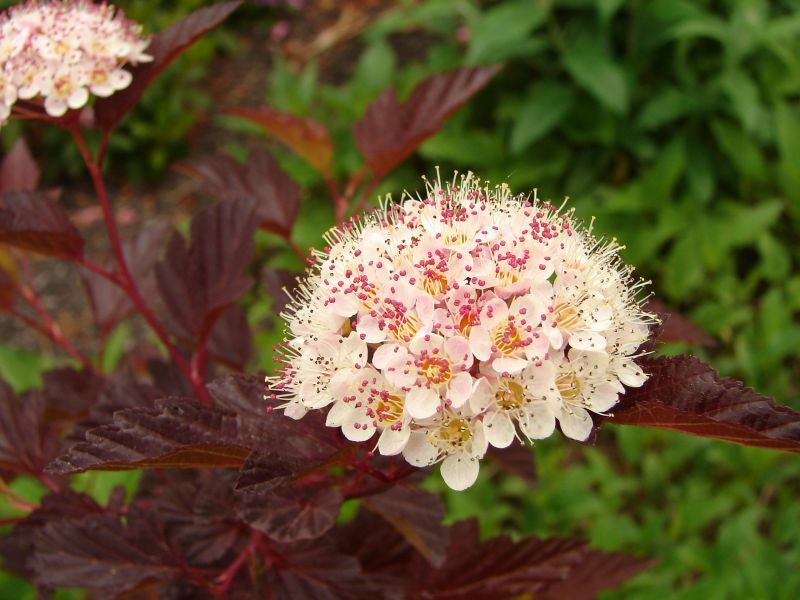 Ninebark is native to a widespread area of North America from Quebec to northeastern and Midwestern USA. Most varieties are fast growing and reach natural heights of five to eight feet tall. They can easily be pruned to keep a neat, compact shape. Ninebark forms next year’s buds on this year’s growth, so for the best show of flowers any light pruning should be done immediately after blooming. The removed branches are lovely in arrangements. Ninebark responds well to a hard prune to the ground in winter if the shrub becomes leggy or needs rejuvenation. Ninebark should be placed in full sun for best foliage colour. For a striking effect try using different ninebark cultivars together. Dark Summer Wine foliage against bright yellow Darts Gold would be an excellent combination and an eye-catching way to showcase ninebark, the shrub for all seasons.